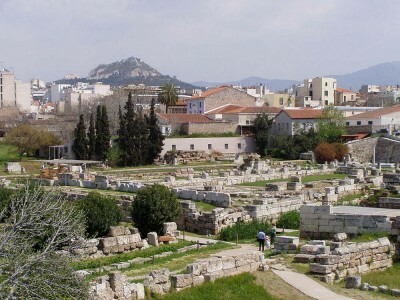 One of the most important necropolises, or ancient cemeteries, in Athens, Greece, is the Kerameikos. The cemetery is named after Keramos, a hero of potters, who was the mortal son of Ariadne and Dionysios. Many potters lived in the area and the location became an organized cemetery in about twelve hundred BC. Two main gates to the ancient city, the Sacred Gate and Dipylon, were once located here. Kerameikos was discovered in the early part of the twentieth century by archaeologists from Germany. The Kerameikos has been subject to many archaeological excavations, with the first being in 1870. Over the years, many burial chambers and offerings from ancient times have been discovered. When a new station was built for the Athens Metro, nearly one thousand tombs from the fourth and fifth centuries BC were found. There are still many large areas that are next to excavated locations that need to be explored. Many of these are under modern downtown Athens. In the Archaic period, many monuments and complex grave mounds were built next to the south bank area of the Eridanos River. In 430 BC an epidemic, that could have been typhoid, struck the city and lasted for a couple of years. It killed approximately thirty percent of the city’s population. Thucydides wrote that dead bodies were left in the streets and at temple sites so they could be collected and quickly buried in a massive grave at the Keramikos. The latest Kerameikos excavation findings include a statue of Kouros that is two meters high. It is the bigger twin of the Kouros that can be viewed in New York City’s Metropolitan Museum of Art. Both were created by an anonymous sculptor referred to as “Dipylon Master.” The most well-known monument is most likely the treasurer tomb which has a bull statue that is the symbol of Dionysus. Close by is the Lysimachides tomb that has a large dog statue. They are many interesting stelae, or inscribed stone slabs, at the Keramikos cemetery. Stelae frequently showed the deceased with their loved ones. One good example of this type of stelae is the Pamphile and Demetria, where Pamphile is portrayed with her sister. 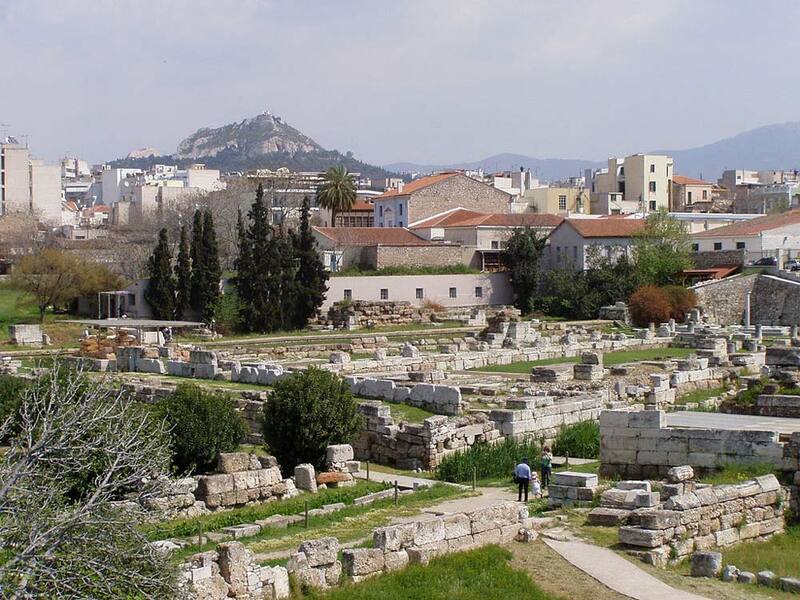 The Athenian City Wall was constructed in the fifth century BC and was divided into two different sections. The wall had two gates, the Sacred Gate and the Dipylon. They were situated at the start of two very significant processional roads in the city, the Sacred Way that went to the Eleusis, and the Panathenaic Way that went to the Acropolis. The Dipylon, at that time, was the biggest gate in the ancient world, and it had four towers in each corner area that were designed to stop intruding forces. A large structure, the Pompeion, was built inside the city’s walls. It was constructed around a very large courtyard. The building was used for festival preparations including the Panathenaia festival, which was a very important event in ancient Athens. Today, visitors can view ruins of the of city’s two main gates, the Pompeion and other impressive military tombs and civilians graves. The Kerameikos Museum is located in a small neoclassical building that is close to the cemetery’s entrance. It displays many monuments that were excavated, such as the famous bull statue and a number of stelae. In addition, there are several Sacred Gate sculptures, large funerary urns, jewellery, toys and a large amount of painted ceramics. Plaster replicas have been made of several monuments and then placed in their original locations. Larger sculptures and monuments can be seen in the museum’s two courtyards. The National Archaeological Museum also has many of the original monuments. Visitors can walk around the outer area of the cemetery ruins, the Eridanos river banks, as well as the ruins of the Dipylon and Pompeion Gates. Most of the Kerameikos is about seven to ten meters below the modern-day street level, since it once was covered by many centuries of sediment deposits produced when the Eridanos flooded.